A while ago, I spent some time in India, travelling around Rajasthan and the north of the country. We ended up in the town of Jaiselmer, deep in the Rajasthani scrublands, a place that feels like the very edge of the world. The big tourist thing to do in Jaiselmer is to hire a guide and trek out on camelback into the Thar desert, spending a night camped out under the stars. At dinner time, our guide squatted down in front of a fire and made chapatis, turning small balls of dough in his fingers until they became flat disks, widening quickly. He slapped each chapati on a flat stone sat in the edge of the fire, the embers glowing, heating the rock through. The chapatis blistered and burned, scorched and hissed on the rock, blackening and cooking. They were rough, coarse, uneven breads, served with a simple curry of chickpeas, carrots and tomatoes. They could well have been the best chapatis I’ve ever had. These types of unleavened breads are easy to make, once you’ve got the knack. It’s about technique and routine. That Indian guide had it in the desert, each chapati the same as the last. The humble chapati is only one of many different Asian breads, but it’s the basis for most, the first in line. One up from the chapati is the paratha, essentially a chapati enriched with oil. The technique involved, folding the oil into the dough, gives the bread a laminated feel, and helps to keep the bread moist. Parathas, like chapatis and other types of roti are best made with chapati flour, but a 50/50 mix of wholewheat and plain flour will do perfectly well – you need 225g of whatever flour you’re using, with half a teaspoon of salt added. Sprinkle over two tablespoons of vegetable oil and form a dough by adding 175ml of warm water. Knead for ten minutes, cover and leave it in the fridge for half an hour to rest. When the dough is rested, divide it into six pieces and roll each one out into a 15cm wide disk. Spread a teaspoon and a half of vegetable oil evenly over the rolled out dough, then gather the edges together to form a ball-like pleated pouch, twisting the open end slight to seal it. Turn the pleated pouch over and roll it out again to the same size as before. Cook the paratha on a hot frying pan, brushing the pan with more oil. Whilst one side is cooking, brush the other with oil, then turn the paratha over to finish cooking, two or three minutes on each side, or long enough for the dough to cook through and start to scorch. It’s best to do one paratha at a time, getting it in the pan before rolling out the next one while it’s cooking. Serve with just about any Indian or Pakistani meal. I haven’t tried making para that’s, but often make chapattis. My neighbour, whose family are from Pakistan gave me some good advice. A tava (a slightly concave rimless pan) is loads easier to use and is as cheap as chips. Roll out the dough (just chapatti flour and water, which should be a fairly soft dough) and kind of flip it and pat it between your palms to knock off any excess flour, then place it on the hot tava. You do not need to use any oil at all. As soon as the dough starts to become more opaque, and it puffs up a bit, flip it over. When it starts to puff up again, take it off the tava (with a metal fish slice or tongs) and lay it directly over the gas flame for a few seconds. It should puff up dramatically. This doesn’t work with an electric hob! These chapattis are as good as you will get. 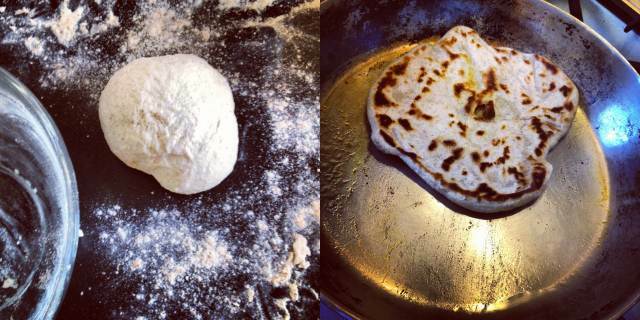 Chapatis definitely need a dry pan, and yes, a tava is the perfect one. These parathas need their oil, though…extra richness!